← Should DMs Be Responsible for Character Generation? A new year is fast approaching, which often brings us to reflect on the events of the past year. As I look back on 2011, one of the highlights for me personally has been playing D&D again after so many years. This blog, too, has been a source of great enjoyment for me. Being a better DM is a challenge all of us face, and the act of writing about my experiences has forced me to be more reflective about what works, and what doesn’t, in my game. This post is my fiftieth since I started the Learning DM blog in late March. Slowly but surely, more and more people have visited the blog, which has been a great encouragement to me. In September, I was honored to be added to Mike Shea’s compiled list of the best 4th Edition blogs at the appropriately named 4eblogs.com. Since then, the audience has grown even larger, for which I am very grateful. I thought it would be a good idea to look back at my posts from this year. Many of what I consider to be the best of my posts came before I joined 4eblogs, and thus perhaps many of my current readers haven’t had the chance to read them. My most-read post was Quick and Dirty Combats in 4E: The Brawl Encounter. Frustrated by the lengthy combat times in 4th edition, as are many other DMs, I experimented with an alternative for 5 minute fights, much more like the combats in earlier editions of D&D. By limiting players to at-will abilities only, and using just minions, you can shave off a significant percentage of combat time. Used sparingly, this can be a nice alternative to a full on, by the book combat encounter. I obviously disagree with this, thinking that the vast number of options available to players is a real detriment to the game, at least as far as combat speed is concerned. Still, it was nice to get some feedback on the issue, and I hope to follow up with further thoughts on brawl encounters in a forthcoming blog post. Moving on, we come to an older, well-visited post: What I Learned from Collecting D&D Minis. Though Wizards of the Coast seems to be focusing on tokens in most current products, miniatures add considerably to the enjoyment of the game for many people, myself included. However, with all the official D&D minis sets out of print, and the new game miniatures-based game still to come, it can be expensive to track down the miniatures you want. In this blog post, I presented a few methods to ensure you are getting the most bang for your miniatures buying buck. 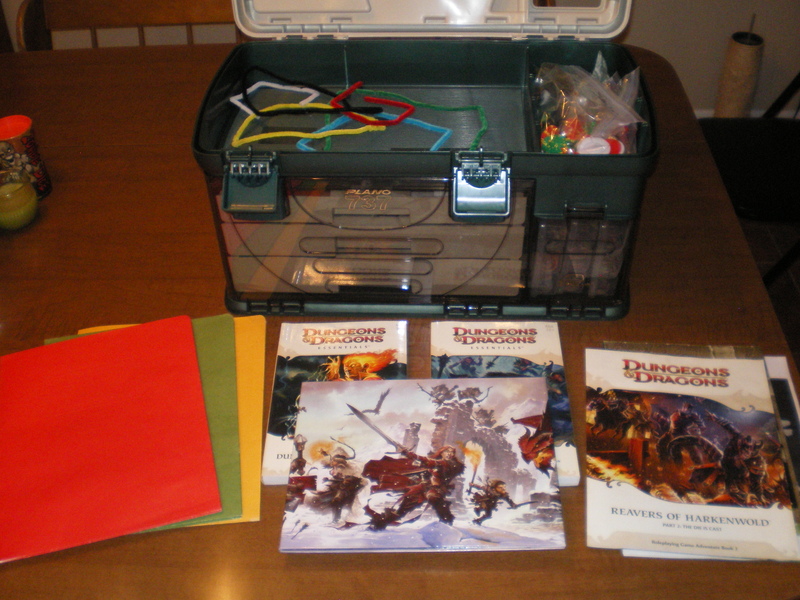 Rounding out the top three posts of 2011 was my personal favorite, How I Learned to Stay Organized: The D&D Box. There are lots of moving parts to a typical D&D table, with character sheets, books, charts, initiative cards, maps, and miniatures to keep track of at any given moment. Maintaining a good narrative can be very difficult when you have to dig through a bag with minis dumped inside, and nothing drags a combat out like searching for a die you forgot to pick out ahead of time. I solved this problem by picking up a large Plano tackle box and adapting it for my Dungeon Mastering needs. I’m especially proud of this article because the pictures turned out great, but even more because several people have told me they purchased their own D&D boxes and use them regularly. The entire point of me writing about my DM experiences is to help others, and this post is perhaps my biggest success in doing so. All in all, 2011 was a great year for me personally. Playing D&D again after so many years away from the hobby is an amazing feeling. I have learned much about becoming a better DM in the past twelve months, and I truly enjoy writing about these experiences. I thank you for reading the blog, and invite you to come back to the Learning DM often next year for more D&D related content. Happy New Year! This entry was posted in D&D, DM Advice, Dungeons & Dragons, Roleplaying. Bookmark the permalink. So, no review on “Madness at Gardmore Abbey”? Best 4e adventure so far, in my opinion.